Made a copy of magazine cover. Just found out I may have broke the copy write law. Not sure, but I’m removing the image anyway. I wrote the name of the magazine wrong. I don’t know why the latest picture of me came out sideways, to humble me, I guess. On my draft it’s right. I wanted to follow your advice and emphasize how I felt after failing all diets for 41 years. Hope you approve. Someone suggested that I was comparing my greater weight loss to the woman’s weight loss in the article. You know, mine is better than yours, therefore insulting to her. I apologize. My size may be smaller, but my head got bigger. One’s weight loss is NOT greater than another. The sacrifice required to lose one pound is just as great as 90 pounds. It’s just repeated 90 times, one week at a time. God’s been so good to me, how could I get so full of pride? Pride before the fall. Last week I picked up your magazine, the June 27, 2016 issue, and read on the front cover of a woman who lost two sizes at age 59. After reading this article I felt led to share my story with you. My name is Deborah Crocker and I’m now 63 years. Beginning at age 61, I’ve lost over 90 and gone from a size 1x to a small, size 6 to 10 top depending on the design and from a size 18/20 pants to now size 8/10 pants and maintained this weight loss for over a year. I hope you consider the publication of my weight loss story to help encourage others as they struggle to lose weight. My name is Deborah Crocker and I’m now 63 years old. Since age 61, I’ve lost over 90 pounds and gone from a size 1x to a small, size 6 to 10 top depending on the design and from a size 18/20 pants to now size 8/10 pants. With God’s help I’ve maintained this weight loss for over a year. I feel like a miracle. In May of 2013 at age 61, convinced I was a failure, I cried out to God in desperation. I asked Him if I needed a counselor since I couldn’t stop myself from eating. All my life, I’ve struggled with obesity and food addiction, My first paid weight loss meeting was in 1974, which became my first dieting failure. After trying numerous diets for 41 years, losing and regaining over 60 pounds at least three times, I gave up. Throughout my adulthood I’ve tried everything, diets, diet pills, services of a dietician, gym membership, accountability partners, weight loss classes, and support groups. Nothing worked. Each attempt started with hope but ended as another failure and gaining back the lost weight plus more. In May 2013, I reached 241 pounds as a result of my dieting failures. I became convinced I was a failure. I wondered if maybe I’m supposed to be this way. In 2011 I volunteered as a cook for the Celebrate Recovery group at my church. It was through this program I realized I had a food addiction. I served supper to recovering drug addicts and alcoholics but I struggled in failure with my own addiction. I attempted to work this program with a sponsor and four different accountability partners. I failed all of them. Then in 2013, I admitted defeat and cried out to God in desperation. So I got a notebook, a Bible, and reported for counseling each morning. I wrote about my food issues and the emotions that caused my overeating. Then I’d read scriptures that encouraged me. Previously for years due to my food addiction I’d been eating nonstop. My husband worked night shift and when he went to work, I went to the kitchen to eat and ate until I waddled to bed. He spoke to my heart, “Now cut your food in half.” I still ate only three meals, anything I wanted but in half portions, with no dieting, and no snacks. Yet I continued to lose weight. As a result of these counseling sessions with God, the compulsion to overeat left. I’m now free from obesity and a food obsession. With God’s help I’ve lost over 90 pounds and found a new freedom with food. 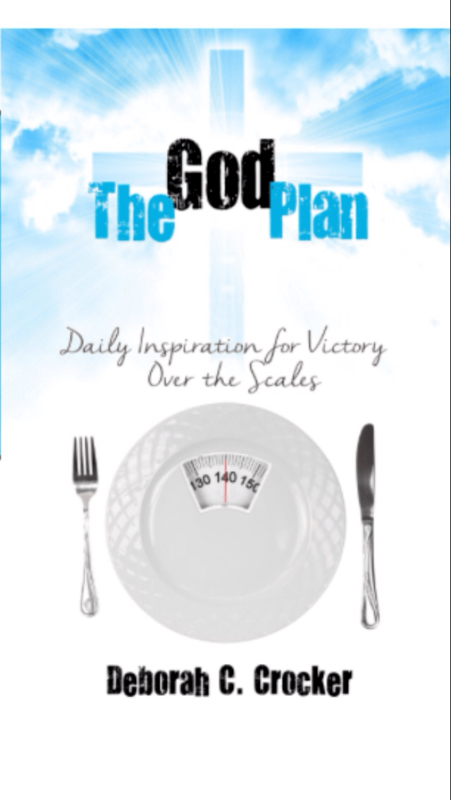 I also published a devotional, “The God Plan, Daily Inspiration For Victory Over the Scales” available through Amazon.com. In this book, I share my experiences to encourage those struggling with excess weight and dieting that God is the answer for their deliverance and freedom. The picture on the left was taken in May of 2013. That pink blouse was the last thing in my closet that still fit. I had out grown everything else. The picture below was taken June 19, 2016 after losing over 90 pounds and maintaining this weight loss for over a year. 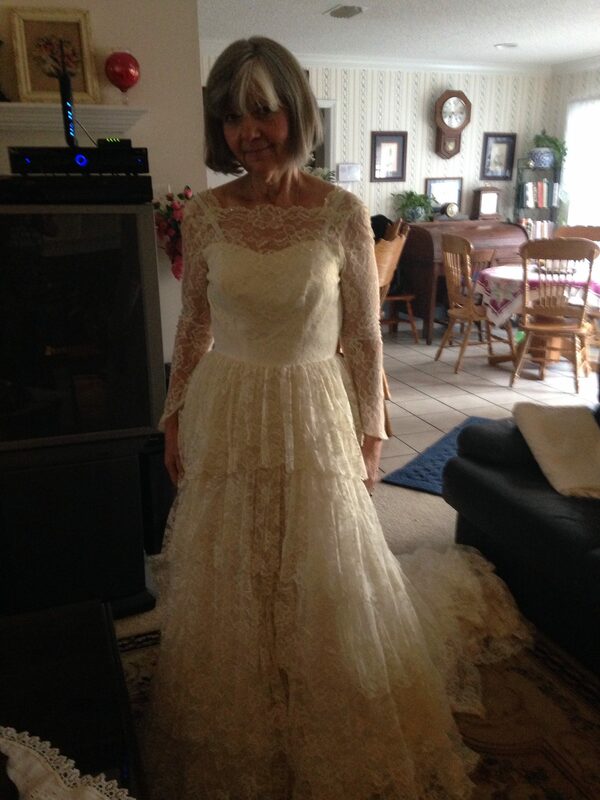 The picture below was taken last March, 2016 to celebrate both my 43rd anniversary and getting back into my wedding dress after 43 years. Last year I couldn’t get my arms into the sleeves. This year the zipper won’t go all the way up, but I got my arms in. love it . . . the one photo (more recent) needs to be turned around . . . your heart felt desperation came out loud and clear. Perhaps more of the struggle and how God reassured you time and again? You ARE an encouragement – I pray it is accepted dear one. Thank you for your encouragement. I did receive a response from them. They thanked me, but stated that due to the numbers of entries they receive they could not guarantee publication. If they used my story they would notify me. You are beautiful and I loved your wedding dress and you of course. I think you should send your write up to the magazine. The only way I can think of to improve the article is to write in a more personal way, especially the part about the before 2013 part- it seems rather scientific and impersonal to me. The post 2013 part reads well and strikes a chord. Thank you Susie for your encouragement. I’m going to try make changes according to your suggestions. No matter how many times I hear or read your story I am always inspired. I love this magazine and truly believe your story can help so many of their readers. Praying they will publish it. I do have one suggestion. You addressed your letter to woman’s day. The magazine is woman’s world.